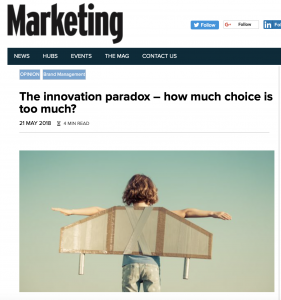 Kantar Australia | Marketing: The innovation paradox – how much choice is too much? Marketing: The innovation paradox – how much choice is too much? The industry is obsessed with innovation, but too many marketers are focusing only on the innovation of product, says Nikki Davey in this exclusive article for Marketing magazine. Taking a step back to examine the way brands innovate and moving away from only functional delivery, companies may begin to see the bigger picture. Discover our expertise in Innovation and Product Development.